Mango season in boom so here is simple mango delicacy, Amrakhand. Serve is with hot puris, chapatis or just as a dessert. 1. 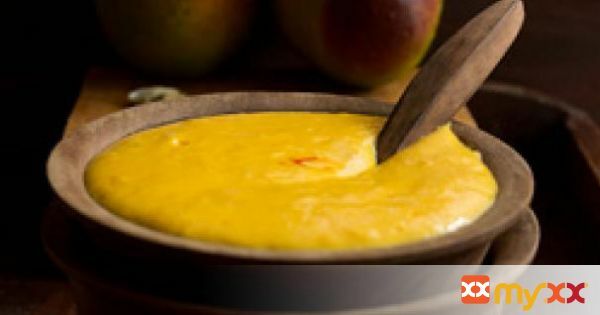 In a blender add mango cubes and sugar; blend it to obtain mango pulp. 2. Now place a strainer over a bowl, put the hung curd and mango pulp into strainer. 3. Thoroughly mix them with a spoon (Strainer is used to ensure smooth and lump free mixture). 4. Add cardamom powder and salt. 5. The quantity of the sugar can be changed according to the taste requirement. 6. Refrigerate the amrakhand for two hours before serving. 7. While serving garnish it with nuts and mango cubes. 8. It can be served as a dessert or it even tastes great with hot puris. 9. Note - Hung Curd – Curd got after removing excess water by hanging it overnight in muslin cloth.